BATH, Maine – Some of the Navy’s futuristic weapons sound like something out of “Star Wars,” with lasers designed to shoot down aerial drones and electric guns that fire projectiles at hypersonic speeds. For the Navy, it’s not so much about the whiz-bang technology as it is about the economics of such armaments. Both costs pennies on the dollar compared with missiles and smart bombs, and the weapons can be fired continuously, unlike missiles and bombs, which eventually run out. The Navy’s laser technology has evolved to the point that a prototype to be deployed aboard the USS Ponce this summer can be operated by a single sailor, he said. 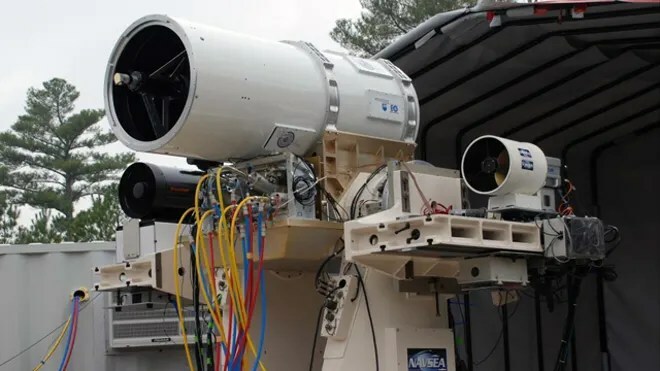 The solid-state Laser Weapon System is designed to target what the Navy describes as “asymmetrical threats.” Those include aerial drones, speed boats and swarm boats, all potential threats to warships in the Persian Gulf, where the Ponce, a floating staging base, is set to be deployed. Aug. 15, 2013: Boeing said blasts from its Thin Disk Laser surpassed 30 kilowatts, 30 percent beyond DOD standards — enough to do some serious damage. Jan. 29, 2013: Following successful tests of 150-kilowatt lasers, the Pentagon announced plans for both the U.S. Air Force and U.S. Navy to carry out tests by 2014. 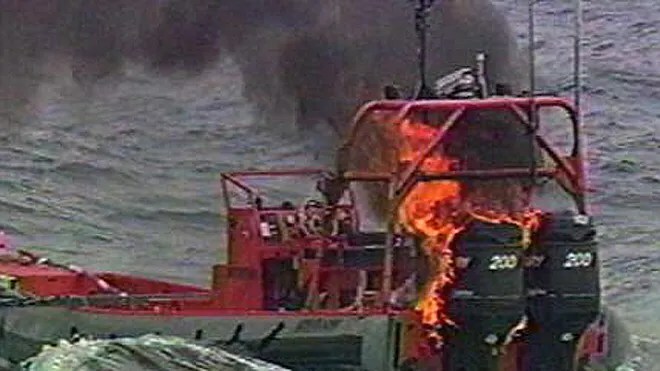 April 8, 2011: In a key test, a gun on a speeding cruiser successfully blasted a robotic boat bobbing in Pacific waters. Feb. 18, 2011: A test blast from a “free-electron laser” set a new power record — a sustained 500 kilovolts of electricity. June 3, 2010: Naval Sea Systems command successfully tracked, engaged, and destroyed several unmanned aircraft with a giant laser. Lasers tend to loser their effectiveness if it’s raining, if it’s dusty, or if there’s turbulence in the atmosphere, and the rail gun requires vast amount of electricity to launch the projectile, said Loren Thompson, defense analyst at the Lexington Institute. 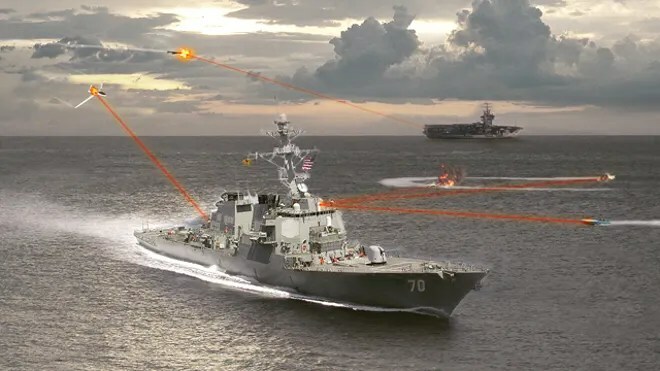 “The Navy says it’s found ways to deal with use of lasers in bad weather, but there’s little doubt that the range of the weapon would be reduced by clouds, dust or precipitation,” he said. The Navy’s new destroyer, the Zumwalt, under construction at Bath Iron Works in Maine, is the only ship with enough electric power to run a rail gun. The stealthy ship’s gas turbine-powered generators can produce up to 78 megawatts of power. That’s enough electricity for a medium-size city — and more than enough for a rail gun. In other words, they’re cheap. Each interceptor missile aboard a U.S. Navy warship costs at least $1 million apiece, making it cost-prohibitive to defend a ship in some hostile environments in which an enemy is using aircraft, drones, artillery, cruise missiles and artillery, Thompson said. With a laser operating on about 30 kilowatts of electricity — and possibly three times that in the future — the cost amounts to a few dollars per shot, Thompson said. The “Star Wars” analogy isn’t a bad one. Just like in the movies, the Navy’s laser directs a beam of energy that can burn through a target or fry sensitive electronics. Unlike the movie, the laser beam is invisible to the human eye. The targeting system locks onto the target, sending a beam of searing heat. “You see the effect on what you are targeting but you don’t see the actual beam,” Ziv said. Other nations are developing their own lasers, but the Navy is more advanced at this point. Most folks are stunned to learn the technology is ready for deployment, Ziv said. “It’s fair to say that there are other countries working on this technology. That’s safe to say. But I would also say that a lot of what makes this successful came from the way in which we consolidated all of the complexity into something that can be operated by (a single sailor),” he said.